Web design is constantly changing and growing, and as such, sites themselves are often changing as well. As a site owner, it's doubly important to keep up on new opportunities and trends and decide which ones will work best to help you achieve your site's goals. Whether you're a design pro ready to incorporate these trends yourself, or just doing some research before meeting with your web designer to discuss ideas, here are four popular techniques that can help give your site the update and edge it needs. Minimalism has been leading the world of web design for years, and it's definitely not going to be going away anytime soon. Its popularity is derived from its simplicity- users are able to easily understand a site's content and navigation, allowing for a straightforward user experience. These designs are also beneficial on the site owner's end, as the clean design reduces the load on the server, minimizing the possibility of a crash and providing faster load time. However, because of the popularity of minimalism, it's also easy to leave a site too plain, and thus, very forgettable, blending in with the thousands of other sites that choose to follow this aesthetic. For a good example of a happy medium between minimalist and flashy, look at the site of The Lobster film. The gray background and black text are minimalism at its finest, while the small animations and distinct font help the website stand out and develop a sense of personality. One of the benefits of hosting a website on an open-source website like Wordpress is the ability to find and custom-tweak premade themes, which is very beneficial to those who are just starting out with web design. But because of their popularity among more novice web designers, many find themselves having the same header as many other bloggers, making it hard to stand out. A simple way to do this is through giving your site a custom logo that can replace these premade headers, either on your own or with the help of a graphic designer. 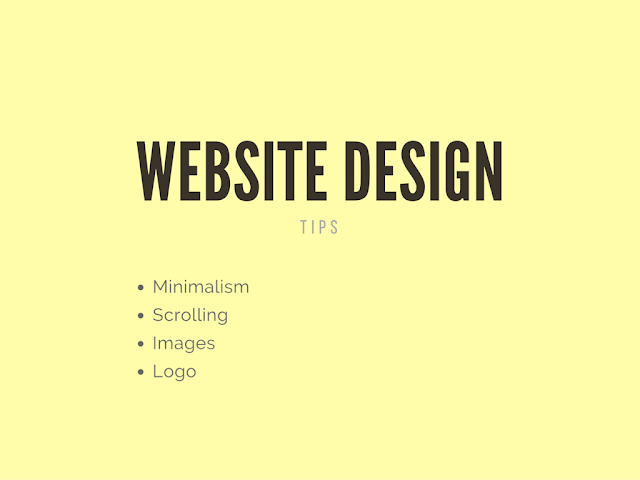 Stuck on how you can create a memorable logo for your site? Think of what you love to blog about or what your site sells and how you can tie it in with your site's name or initials. Buy the Best Drone, a drone website, is an excellent case of a website finding a simple yet effective way to solidify their branding through a unique logo - the incorporation of a quadcopter drone is clever and effective. Like minimalist themes, scrolling is another trend that has caught on quickly. One of the largest reasons for the popularity of scrolling web sites is its suitability for a variety of screens and devices- the design lends itself particularly well to smartphones and tablets, as scrolling is essential on smaller screens. This style also has a higher potential to create user engagement on content-heavy sites as readers are encouraged to continue scrolling and discover more offerings without being prompted to change their page. Scrolling designs can either take the form of page-wide displays that are shown one-by-one, or the card-style display made popular by sites like Pinterest, which display multiple items at once. However, those who are updating to a scrolling design should be sure to remove any important links or information in the footer and place them elsewhere in the navigation, as visitors will be unable to reach the bottom of the page. You've probably come across a hero image by now, but just didn't know its name. A hero image is a large banner or background image, taking up most or all of a sites homepage. These are popular for a variety of reasons- they can simply direct users to a call to action, can carry a strong visual message, and have less loading time than a site with multiple images and tabs would. Hero images are especially good for sites providing visually-based services like photography or jewelry design, or those with a simple goal like encouraging readers to sign up for a newsletter. Want to make your hero image even more striking? Consider using a looping video- preferably in the 10-20 second range to provide viewers with enough information, yet still maintain a manageable loading time.